With 2018 coming to a close, it’s time to plan for the new year of travel ahead. If you’re looking for some inspiration for your adventures in 2019, travel books are a fun way to spark your wanderlust. Books also make excellent gifts, so spread the love of travel this holiday season with travel books for everyone on your list! Adam Shoalts, one of Canada’s foremost explorers, tells the stories behind ten historical maps, and how they came to shape what became Canada. It’s a story that will surprise readers and reveal the Canada we never knew was hidden. It brings to life the characters and the bloody disputes that forged our history, by showing us what the world looked like before it entered the history books. 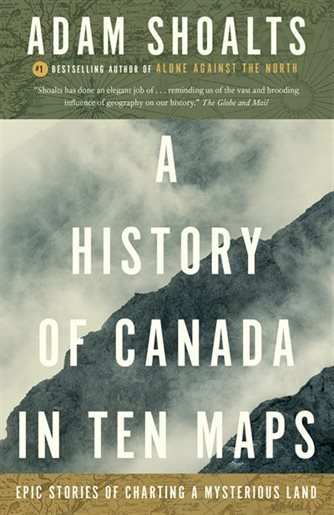 Combining storytelling, cartography, geography, archaeology and of course history, this book shows us Canada in a way we’ve never seen it before. If you love this book: Experience our incredible country in a single journey with Wells Gray Tours as we travel Coast to Coast by Train this May. Experience Canada’s national railway on this journey from Vancouver to Halifax. From the towering giants of the Rocky Mountains to the sea of grass in the vast prairies; from the unique mix of cultures in Montréal to the Scottish influence in the Maritimes; from the awesome view at the CN Tower to the spectacle of Niagara Falls — all aboard for the adventure of a lifetime! If you’re planning a trip anywhere in Scandinavia this year, this book is for you! Celebrated author Neil Gaiman has long been inspired by ancient mythology in creating the fantastical realms of his fiction. Now he turns his attention back to the source, presenting a modern rendition of the great northern tales. 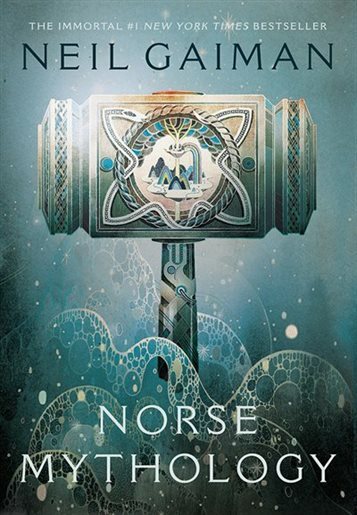 In Norse Mythology, Gaiman stays true to the original myths but fashions the stories into a novelistic arc that begins with the genesis of the legendary nine worlds and delves into the exploits of deities, dwarfs, and giants. Through Gaiman’s deft and witty prose emerge these gods with their fiercely competitive natures, their susceptibility to being duped and to duping others, and their tendency to let passion ignite their actions, making these long-ago myths breathe pungent life again. If you love this book: Experience the land that inspired these epic tales this July on an incredible Norway Fjords Cruise on Holland America’s magnificent new ship, Nieuw Statendam. On this tour we will visit Viking-era villages, view breathtaking waterfalls, tour immense glaciers, and experience the magic of the midnight sun. 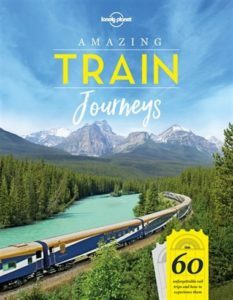 Just released in October, this brand-new guidebook includes information on 60 of the world’s greatest and most unforgettable train journeys, from classic long-distance trips like Western Canada’s Rocky Mountaineer and Darwin to Adelaide’s The Ghan, to little-known gems on regular commuting lines. Amazing Train Journeys is the culmination of asking more than 200 travel writers for their absolute favourites. Each profile contains practical information including ticket options, timetables and stops, plus inspiring photos and illustrated maps. If you love this book: Wells Gray Tours has a few of our own fantastic train journeys planned in 2019, including Scenic Switzerland by Rail, a circle tour of Switzerland featuring nine train rides, and Scenic Railways of Colorado, a seven-train tour of the spectacular scenery this state has to offer. Frozen in Time tells the dramatic story of how Sir John Franklin’s elite naval forces came within sight of the Northwest Passage, only to succumb to unimaginable horrors. 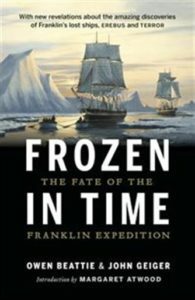 A gripping tale of cannibalism, bureaucratic hubris, great courage, and ground-breaking science, it shows how the excavation of three sailors from the 1845–48 Franklin expedition, buried for 138 years on the Arctic headland of Beechey Island, has shed new light on what has been one of the world’s great maritime mysteries. If you love this book: Cruise this legendary Arctic route with Wells Gray Tours this August on a Northwest Passage Expedition Cruise with Adventure Canada. Take the trip of a lifetime aboard the 198 passenger Ocean Endeavour with experts on the Arctic including geology, glaciation, history, and flora and fauna. There are also expeditions ashore and to nearby attractions, using the ship’s 18 zodiacs. Our fearless leader, Roland Neave, first visited Wells Gray Park in 1966, drawn by the spectacle of Helmcken Falls. His first book, Hiking the High Points was published at age 17. 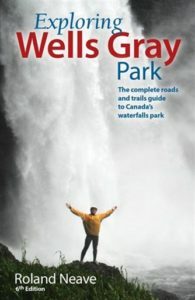 With the encouragement of his university professors, Roland began gathering material about Wells Gray Park and his guidebook was first published in 1974. He devoted his summers to organizing bus tours of Wells Gray Park and, after graduation, expanded this service into a year-round business called Wells Gray Tours. If you love this book: Visit Wells Gray Park with the most knowledgeable guide on the planet. Sign up for one of our tours to Wells Gray Park led by Roland Neave himself. We offer multiple tours to Wells Gray Park each year, so contact us to find out which departure is right for you. These tours ALWAYS sell out, so book early! The Golden Spruce is the true story of a glorious natural wonder, the man who destroyed it, and the fascinating, troubling context in which his act took place. Kiidk’yaas (meaning ‘ancient tree’ in the Haida language), also known as ‘the Golden Spruce’, was a Sitka spruce tree that grew on the banks of the Yakoun River on the Haida Gwaii archipelago. Grant Hadwin, the man who cut it down, was passionate, extraordinarily well-suited to wilderness survival, and to some degree unbalanced. 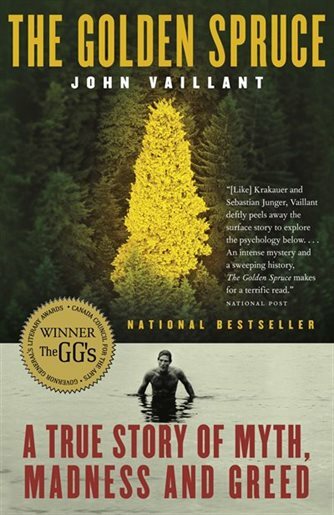 But as John Vaillant shows in this gripping and perceptive book, the extraordinary tree stood at the intersection of contradictory ways of looking at the world. Taking in history, geography, science and spirituality, this book raises some of the most pressing questions facing society today. If you love this book: We’re confident that after reading about the natural and cultural wonders of Haida Gwaii you’ll want to experience this magical place for yourself, and you’re not alone! Every year our Haida Gwaii tours sell out extremely quickly. Wells Gray Tours has multiple tours to Haida Gwaii planned for 2019. 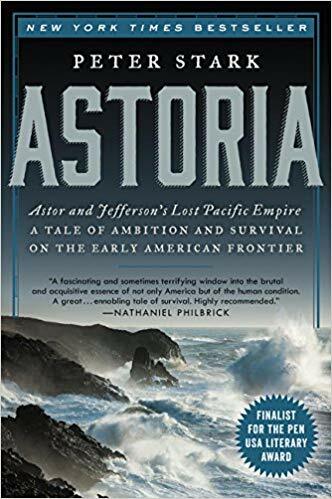 Astoria is the thrilling, true-adventure tale of the 1810 Astor Expedition, an epic three-year journey to forge an American trading empire on the Pacific Coast, centered at present-day Astoria, Oregon. 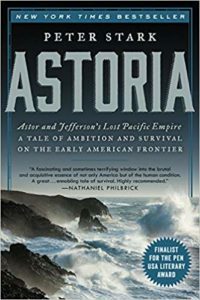 Peter Stark offers a harrowing saga in which a band of explorers battled nature, starvation, and madness to establish the first permanent American settlement in the Pacific Northwest, and opened up what would become the Oregon trail, permanently altering the nation’s landscape and its global standing. If you love this book: Learn more about the state of Oregon and get ‘hands on’ with a variety of local experiences on our brand-new tour, Hands On Oregon. We’ll learn from local artisans, sample delicious local food and drink, and get active as we explore the entire length of this beautiful state. This tour will be released for sale soon, so contact us to get on the ‘Interested’ list and be the first to know when it’s ready to book! This epic story chronicles the story of the men and women who fought against all odds to fulfill the 400-year-old dream of constructing an aquatic passageway between the Atlantic and Pacific oceans. It is a story of astonishing engineering feats, tremendous medical accomplishments, political power plays, heroic successes, and tragic failures. 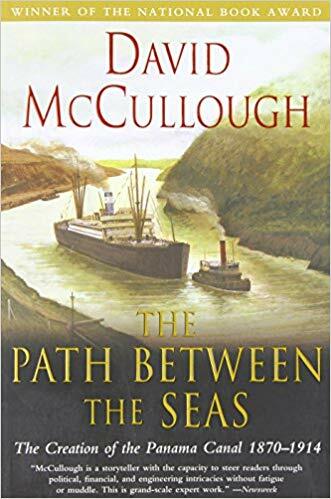 Winner of the National Book Award for history, the Francis Parkman Prize, the Samuel Eliot Morison Award, and the Cornelius Ryan Award (for the best book of the year on international affairs), The Path Between the Seas is a must-read for anyone interested in American history, the history of technology, international intrigue, and human drama. If you love this book: Join Wells Gray Tours this April on a 21-day Panama Canal Cruise aboard Holland America’s Oosterdam. A Panama Canal expert is on board to explain the history and technical operations as your ship passes through the locks. Locally guided tours in Cartagena, Panama City, Costa Rica, Nicaragua, and Guatemala are also included.